“I’d sum up HSBC’s history in Poland to date in three chapters. From the beginnings of Poland’s transformation, the bank was active in the area of investment banking and advisory work related to privatisation of the Polish economy. This was the first chapter of the early 1990s; during these transition years to a free market economy, Poland generally followed the UK’s privatisation model – trade sales that matched specific state-owned enterprises to specific sectoral investors. This was in contrast to the ‘coupon’ or voucher mass-privatisation model seen across the region in markets such as Russia and then Czechoslovakia at that time. Though undoubtedly some mistakes were made in those pioneer privatisations, such as very low valuations or mismatched investors looking to quickly extract profits from the investment, the alternative route to move from a centrally planned economy to a free market – as seen in some of the countries of the former Soviet bloc - would have been an unbalanced economy, often dominated by large conglomerates in the hands of oligarchs. Poland, in contrast, came out of those challenging times of economic and political transformation of the 1990s with a rather healthy and diverse private corporate sector. Ad so, the 1990s were a decisive decade for Poland, opening the path to EU membership. It was the era around EU accession that forms the bank’s second chapter. This was HSBC’s move into consumer banking. “EU accession brought rapid growth in aspirational demand as the economy grew and consumers wanted to catch up with western European trends and standards. As such, the bank’s focus was on retail consumer finance as well as premier banking. An effective retail banking platform requires two things first and foremost. The first is technological and product innovation, which is very much HSBC’s sweet spot. The second key factor is scale required to effectively support operational and regulatory requirements.” This has proven to be a major challenge for many smaller banks operating in this sector. Additionally, the 2008 global financial crisis brought about a strong fall in interest rates worldwide. 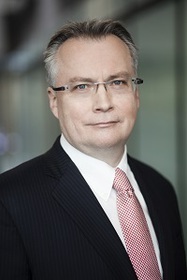 “This left net-interest margins, a major source of income for traditional commercial banks, falling sharply and negatively impacting returns to shareholders as simultaneously the banks were required to boost their capital base.” While being attracted to the Polish consumer market, HSBC considered these headwinds and decided to exit retail banking and fully focus on the fast developing corporate and commercial sectors of the Polish economy. “The second chapter of HSBC’s operations in Poland came to a close in 2011, opening the third – focusing on corporate and commercial clients, both inbound international companies (FDI to Poland) and – increasingly – outbound (Polish companies expanding abroad). There is a growing number of great examples of such expansion such as Tele-fonika Kable and its acquisition of JDR Cables in the UK. Over many years of operating an international footprint spanning all major global markets, HSBC has the experience in managing international mergers and acquisitions for both international conglomerates as well as large local corporates taking their first steps into onto the international arena. Often, these first steps are to the ‘near abroad’ – such as the markets of the CEE region – then on to the UK and beyond Europe. The UK actually sometimes serves as a window onto the global markets for Polish economies undergoing an international expansion. Today, recruiting and retaining the best talent for a BPO is a key success factor. Mindful of that fact, HSBC is in active dialogue with the top universities in Kraków, to jointly develop collaborative programmes aimed at supporting their students both in terms of their first jobs post-graduation but also tech-related and real-case based programmes tailored to the universities’ curriculums during their studies. “An interesting development for future graduates looking at the financial services sector is the dynamic growth of FinTech links with the traditional banking sector providing prospects of working in a bank with the excitement of rolling out new tech-based solutions.” London’s ‘Flat White Economy’ to quote from the title of Doug McWilliams’ book is an entire ecosystem constructed around the tech sector. The development of this ecosystem is very much dependent on properly tailored education, staff mobility, even cafes etc, creating a location to attract people. London has been able to create exactly that type of a “pull” effect. Let us now turn to the more traditional segment of trade and trade finance. “Supply chains are being reshaped by ongoing global changes – as demand and supply relations need be reconfigured to new geopolitical conditions. Companies from emerging markets are increasingly ready to engage into existing as well as new supply chains. To reach out for new, opportunities, new horizons. The current US-China trade dispute, for example, may offer opportunities for CEE economies – as EU manufacturers and food processors aim to replace those in the US. Could Polish companies step into such supply chains? It is worth noting that Chinese companies are currently actively exploring the Polish market in this regard.” The Chinese government’s Belt and Road Initiative may provide an answer to the current situation where many empty rail containers are going back to China, tempting European exporters with good rates (west-to-east freight prices are less than half of east-to-west prices). “In this context, Poland faces both opportunities as well as challenges in its international trade. To effectively address both, the Polish economy needs a strong push in the realm of economic diplomacy to support its so-called pivot to Asia. On the one hand, we currently have a growing number of infrastructural projects, some facing execution challenges well reported in the press, being subject of strong interest from Chinese firms. In the opposite direction, Polish firms are actively seeking better access to the fast-growing Chinese consumer markets for agricultural produce such as fruit and vegetables, poultry, dairy. Such a situation suggests a win-win resolution to any negotiations to be likely. “Today, the Polish economy is fortunate for having a number of key international banks operating in Poland. Many of them with global reach. HSBC, for example, is present in and connecting 66 markets worldwide. As a result, Polish companies looking to expand internationally can choose the best from the international banking sector. As already mentioned, HSBC can effectively assist across over 60 markets worldwide from the United Sates to markets of Asia and the Middle East. HSBC’s strong historical ties to Asia (as Hong Kong and Shanghai Banking Corporation) show the credentials and market expertise the bank has in its ability to help Polish exporters do business in Greater China as well as other Asian markets. In FDI flows, it is also worth noting the growing levels of capital from Asian markets being invested in Polish real estate. “We are seeing examples of Asian funds, for example, investing in various real estate projects around Warsaw today. As such, we are seeing a new supply chain developing – the supply chain of capital. “International expansion, trade is often the first step to future foreign direct investment (FDI). In working with our clients, we can see that trade fairs – making direct contact with foreign trade partners – are sometimes more effective ways into new markets. Depending on the sector, well-structured trade missions, with effective follow-up can also be of value in penetrating new markets. Especially in case of relatively smaller companies. These are all important factors for Polish companies. Some of them may feel some uncertainty stepping out for the first time out of their comfort zone and into these unfamiliar markets after having enjoyed years of consistent growth at home, with stable forms of financing from a liquid domestic banking sector. Selling within Poland or to the near-abroad within the single European market, financed with basic trade finance products and overdrafts from local banks has been successful in the past. So why diversify the risk? Why try new forms of financing? Sustainable finance is another area of strong focus at HSBC. “Being part of the sustainable economy means seeking ways of supporting business growth models in a rapidly changing world which consider such factors as social as well as environmental benefits from such development. “A good example of financing aimed at supporting such strategies is social finance – which can take the form of social bonds and green bonds. We can see very good examples of such forms of finance in a number of European countries, where for example partnerships between central and local governments issue bonds and raise debt to finance such projects as renovation of social housing or implementation of new technologies aimed at reducing harmful emissions into the environment.” HSBC has been a lead arranger of a number of such programs, including the first green bond issue by the Republic of Poland.